Food Costs > How Much Do Mason Jars Cost? How Much Do Mason Jars Cost? Mason jars are glass jars used to can and preserve food. Mason jars are used to store a variety of food items but are commonly used to store jams or fruit. The cost of a mason jar will depend on the brand and how many come in a pack. A single 4, 8, 16 or 32-ounce mason jar can cost $1 to $5, while a 12 pack of one-quart wide mouth mason jars made of tempered glass can cost $10 to $22. This can really depend on the time of year and retailer. What you may find is that during the canning season, the jars can be a lot cheaper than the non-canning season. A case of 12 1-quart regular mouth mason jars can cost $10 to $20, while half gallon jars can cost $10 to $25 per 12. For example, Walmart sells a 24 pack of four-ounce jelly jars for $19 and $27 for a 24 pack of Ball wide mouth pint jars. The Dollar Tree, on the other hand, has a 16-ounce jar available for $1. Bottles with side handles that resembles a mug can cost $20 to $30 for a pack of 12 16-ounce mugs. Antique mason jars manufactured in the early 1900s could cost upwards of $30 to as much as $300 per set. Colored mason jars, which often come in colors like red, purple, blue, green and yellow, can cost $10 to $15 per half a pint four pack. 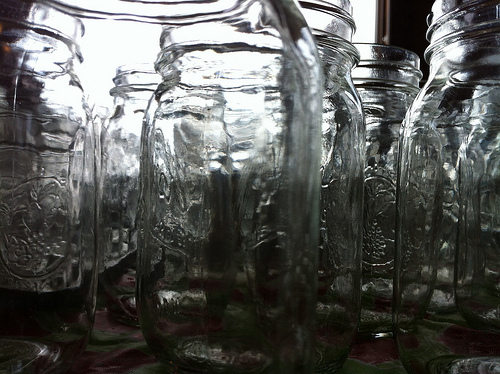 Plastic mason jars can be much cheaper, retailing for about $20 to $25 for a package of 50 eight-ounce jars. Most mason jars are going to come with the lid and ring and common sizes may include 16 or 32 ounces. Small jars designed to hold jam will be four ounces. Jars will either be labeled as “regular mouth” or “wide mouth.” Regular mouth jars are best with foods that are pourable such as sauce, salsa, vegetables and jams. Wide mouth jars will be designed for whole vegetables and fruits. These jars can often be found at most big-box retailers such as Walmart, Big Lots as well as at local hardware stores, thrift stores if purchasing used and online with retailers like Amazon.com. Mason jars will often be sold individually or often in a four, 12 or 24 pack. Popular brands include Ball and Kerr. Replacing and/or upgrading the mouth lids for the jars can cost about $10 to $15 per four pack. This often happens if you purchase used and the jar didn’t come with the lids. Customized mason jars with designs can cost a little more than the standard, blank jars that most stores sell. Can you freeze mason jars? Freezing is possible if you use a half pint or pint-sized wide mouth canning jar. If you were to use anything smaller or different than a wide mouth, it could crack when the jars expand. On the popular brands like Ball and Kerr, you will notice a freeze fill line that’s about an inch below the rim. If you intend to freeze your food, make sure it doesn’t go above this line. Can you microwave mason jars? As long as you remove the lid and top, the jars can be microwaved safely. Consider purchasing in bulk if you plan on doing a lot of canning. The more jars that are purchased, the more that can be saved per jar. Consider going to local garage sales or estate sales because this is a common item found at many sales. Before purchasing, though, make sure you pay close attention to the outside of the jar to make sure no cracks or scratches are present. Thrift stores are a popular place to find good looking mason jars. Again, like garage sales, pay close attention to the outside to make sure they are in tip-top condition. Some people online have stated they were able to get jars for as little as $0.30 each. Craigslist is a great place to find canning jars for a low low price. While some listings may have prices way too high, you may want to either try to haggle and/or check daily to see if any deals come about. Usually, if you’re able to get a jar for less than $1, then it’s considered a good deal. onehundreddollarsamonth.com says Winco, if you have in your area, is a great place to find mason jars. Here, they usually beat all grocery store prices in the area and will have a great selection all year round. The blog notes even if you purchase one every time you go grocery shopping, it will add up over the year. Check out local hardware stores and retailers during the canning season to see if they are offering any sort of promotions. Some have had some success with Freecycle.